To some degree, with the proliferation of mobile devices in recent years, it is at times hard to imagine a time where work ended at our respective offices. It can be increasingly hard to be present, as those boundaries can be mighty blurry. But not needing to run back to an office to do something — whether it’s while you’re standing with a client in an apartment or sitting bedside with an ill relative — is truly priceless, and the ability to act swiftly can be the difference between getting the deal done or not. In real estate, with its abundance of forms, there are a seemingly endless number of areas to be filled in, documents to be reviewed, signed, taken apart, put together. Finding an easy way to insert instructions can be difficult, especially as many transactions can involve clients, customers and colleagues who are geographically disparate at any given time and you cannot always be face to face to explain different sections and where a signature or initialing may be required. One of my mobile devices of choice at the moment is an iPad. Over the years (hard to believe its been a few years since the original iPad was unveiled, isn’t it?) I’ve tried a number of programs. Reading a PDF is easy enough; the complications come when a signature is needed, or adding notes. The ability to drag and drop files, specifically directly to cloud storage (and background downloading/sync). Stacking my most frequently used files as favorites. Color tags, used primarily to categorize project types. When collaborating, often there are any number of documents going back and forth. I tend not to send/share “live documents,” but rather PDFs. Being able to see changes/annotations in review mode, similar to Microsoft Word, is a big bonus. The background sync seems to work in a more seamless fashion; this is especially important, as I am able to sync to both my corporate and personal documents, and have them easily accessible when I am offline but still need to work, i.e., when I’m riding the subway. In my opinion, it’s one of the few apps I have paid for that has proved its worth for personal, professional and philanthropic use. It also seems to come up as a perennial favorite in the iPad & iPhone Group for agents on Facebook (started by Mike Bowler and with several admins, myself included). 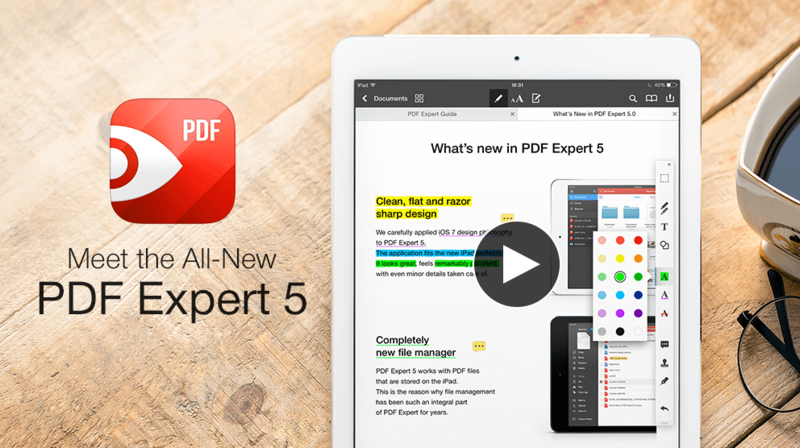 Will you be upgrading to PDF Expert 5? There’s no upgrade pricing, so it is $9.99 for this new iPad version. I have found this to be on the list of the handful of apps I would certainly pay full price for, but keep an eye out on their social channels, as you never know what deals might come along. What works for your work flow? Share with us in the comments! Full disclosure: I was provided with early access by Readdle to PDF Expert 5 in order to compare and contrast it to the most current version of PDF Expert.